This montage shows three clusters of bright, young stars in X-ray (blue) and infrared (green) light that lie in the direction of the center of the Galaxy. Like many stars in the disk of the Galaxy, they are difficult, if not impossible, to see with an optical telescope because of interstellar dust that blocks the visible light. Infrared and X-ray data provide evidence for a large amount of dust and gas along the line of sight to the cluster, DB01-42. Invisible to optical telescopes, it is located near the Galactic Center, about 26,000 light years from Earth. Most of the stars in the image produce infrared radiation from their surfaces which have temperatures of several thousand degrees Celsius. The X-radiation from the two bright X-ray sources near the center of the cluster requires gas with temperatures of millions of degrees. Such extremely hot gas may be due to the collision of stellar winds from two closely orbiting stars. The two bright X-ray sources in the image are likely close binary stars with high-speed stellar winds. The diffuse X-ray glow could be caused by the combined heating of gas in the cluster by winds from many stars. 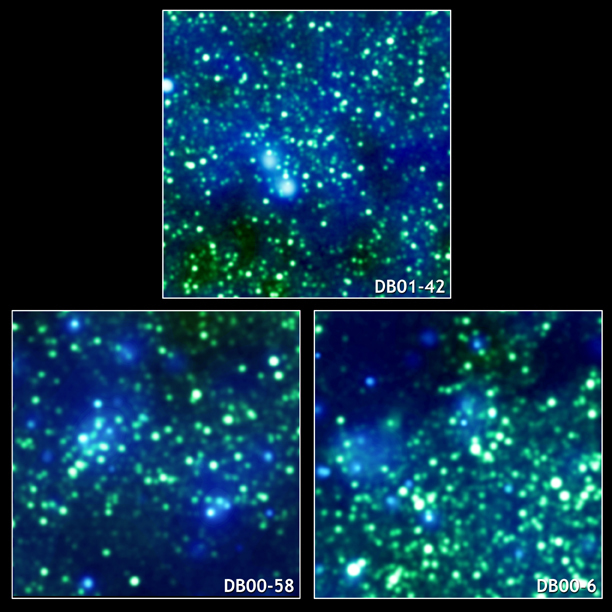 The light from the stars in the two clusters, DB00-58 and DB00-6 show much less X-ray and infrared absorption. This lower absorption, which still blocks much of the visible light, indicates that these star clusters are not in the Galactic Center, but are foreground objects. The way in which the X-rays are produced in these clusters is likely to be similar to DB01-42. Coordinates (J2000) RA 17h 47m 9.40s | Dec -28° 46' 26"
Coordinates (J2000) RA 17h 44m 52.50s | Dec -29° 40' 48"
Coordinates (J2000) RA 17h 44m 59.90s | Dec -28° 51' 37"